Micro-fine, hairline scratches can often be removed by hand using a non-abrasive paint cleaner or swirl remover polish like Meguiar’s ScratchX 2.0. It safely and effectively removes below surface defects like fine scratches and bonded contaminants from paint surfaces, while enhancing the paint’s gloss. Unlike many of today’s overly abrasive scratch removing formulas, ScratchX 2.0 will not leave more scratches than it removes. The product is ideal for solving isolated paint problems and can even be used to revive a vehicle’s entire paint finish. If it is possible to remove a blemish or scratch by hand, ScratchX 2.0 is the perfect solution. ScratchX 2.0 is not a wipe on, wipe off product like a wax; it's more of a wipe on, and gently work it into the finish product. You will need a clean, even coat applicator pad or a foam applicator pad to work the product into the finish and a good quality terry cloth towel, like Meguiar’s Supreme Shine Microfibre, for wipe off to make certain that your effort provides the desired result. It’s important to note that using premium quality applicators and towels insures that you do not inflict any additional scratches back into the paint surface. The only way to properly remove a scratch from a paint finish is to reduce the thickness of the paint finish down to the bottom of the scratch. You have to level the highest point of the surface with the lowest depth of the defect. See the diagram below. Wash your car first to remove loose dirt and fresh above surface contaminants. Remember to always work in the shade, and on a cool surface. It is important to focus your efforts on the affected area. Work one area at a time, about 8 – 12 inches square, or smaller, depending on the defect. Apply a small, even amount of product with an applicator, or soft, clean, 100% terry cloth towel, and thoroughly work ScratchX 2.0 into the finish to remove the defect. Work the product into the finish until it looks as you have almost run out of product and/or the product has turned clear and oily looking. This is an indicator that you have worked the diminishing abrasives long enough to break them down. The trick is to work the product in until it just begins to disappear, applying more than one application if necessary. Let the product dry before wiping off any excess with a clean, soft, microfiber polishing cloth, like Meguiar’s Supreme Shine Microfibre, or a 100% cotton, terry cloth towel and inspect your results. If the defect has been removed to your satisfaction, proceed with an application of polish or wax, like Meguiar’s Ultimate Compound. If the defect, or scratch, still remains, then re-apply the product, and repeat steps 3 and 4. ScratchX 2.0 paint cleaner, like all Meguiar's paint cleaners, contains a diminishing abrasive. In the case of ScratchX 2.0, this diminishing abrasive is microscopic in size. As you work ScratchX 2.0 into the finish, the microscopic diminishing abrasives gently abrade the surface, which means that it wears it down or rubs it away with friction. This abrading action will remove a small amount of paint. During this process, as you work the product into the finish, these diminishing abrasives start to break down. Once they break down, they stop abrading the finish and actually start to polish the finish to a clear, high gloss. This diminishing action turned polishing action is a benefit to you because it enables you to work out defects without leaving scratches behind. That's the secret to polishing paint and removing defects, doing it in such a way as to not leave more scratches in the finish than you remove. However, here's something that's important to remember. Because the diminishing abrasives break down, you need to re-applyand repeat the process until the defects are removed. How many times you need to re-apply and work the ScratchX 2.0 depends on the hardness of the paint and the depth of the defects that you're trying to remove. 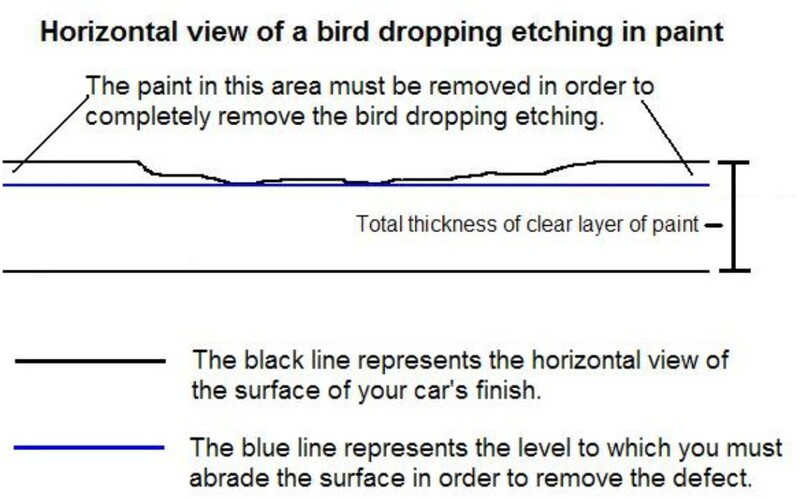 Removing a bird dropping etching, or a scratch, from a clear-coated finish usually requires more than one application. High gloss clear coats are thin, delicate surface coatings that are easily dulled and easily scratched. Once they are dulled down and/or scratched, it takes the right product and the right technique to bring them back to a clear, high gloss finish. Some below surface defects can take more experience and skill to remove depending on the defect and the thickness of your paint. Clear coats finishes are generally harder than traditional paints. This means that it is more difficult to remove defects especially by hand. This, in part, explains the increase in popularity of dual action polishers like Meguiar's MT310 Dual Action Polisher. Novices can quickly master the use of a dual action polisher or orbital buffer without any risk of burning the paint finish. These buffers oscillate backwards and forwards while spinning, mimicking hand motions, and will yield a more even application of cleaners, polishes and waxes, provide deeper cleaning, and safely remove swirls. Rotary buffers, on the other hand, are best left to trained professionals. Meguiar’s always recommends using the least aggressive method to yield the best results, and ScratchX 2.0 is guaranteed to deliver the highest results possible by hand. If ScratchX 2.0 cannot remove a scratch or blemish, only machine applied professional formulas can do the job. Have patience, and remember: "A little technique goes a long way."